From building your dream home to undertaking major construction works, then chances are you will need a contour and feature survey completed first. Also known as a site survey or topographic survey, these types of surveys usually form the initial stage of any land development. 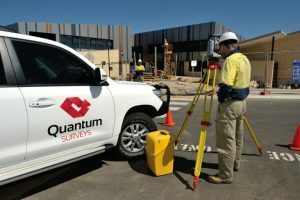 Quantum Surveys perform contour and feature surveys to produce an exceptionally high quality, detailed plan that shows existing natural and visible manmade features together with heights and contours. These plans can be supplied to your architect, engineer, planner or builder for building planning and design. These plans are also used as the basis for a council application for development approval. Quantum Surveys contour and feature plans are prepared utilising industry standard AutoCAD drafting software. The plans are supplied electronically in AutoCAD (DWG and DXF) format and Adobe (PDF) format with hard copies supplied as well. If you are planning on building a fence or wall on your property boundary, building a new house on or near your boundary or making extensions to your existing house that gets close to the boundary, a boundary re-establishment survey or re-peg, is required. A re-peg survey is a legal survey where we must order and examine all field records and books for that particular area. All original cadastral survey marks must be looked for, with the Law requiring the Licensed Surveyor to renew boundary marks that describe the legal boundary of the Lot. The accuracy is exact and all structures on or near the boundaries are located and referenced on a re-peg plan. A signed Licensed Surveyors Certificate is attached to the re-peg plan at the completion of the survey as evidence that the survey has been performed by a professional Licensed Surveyor. Only a Licensed Surveyor who holds a current Practising Certificate issued by the Land Surveyors Licensing Board of Western Australia is authorised to undertake this work. As these are legal surveys, our survey field books must be lodged with Landgate. Lettable Area Surveys are used to determine the gross or net lettable area of floor space for commercial, retail and industrial premises. The Property Council of Australia’s Method of Measurement provides the guidelines for measuring floor space in leased premises. It is also designed to help parties establish accurate and consistent measurements of tenancies or building size. Only a Licensed Surveyor who holds a current Practising Certificate issued by the Land Surveyors Licensing Board of Western Australia is authorised to undertake this work. A survey plan showing the boundaries, building outline and areas of each tenancy is prepared by our experienced team and is partnered with a detailed report. For large and small scale building or house designs, we are able to provide a service involving both a computer prepared layout (in which any plan errors usually become evident) and a building set out. This is all tied to the cadastral system to obtain exact side boundary clearances and road setbacks. We can accurately set out and position any feature that a builder requires. This can include building corners, gridlines, marking profiles, holding down bolts, offset marks and positioning tilt-up panels. If requested, a survey plan showing the points that were set out, can be prepared by our qualified team.